Emory Law's Center for Professional Development & Career Strategy offers a fresh approach to helping students transition to practice. We provide the structure, oversight, guidance, and resources that enable students to explore their unique professional journeys effectively while leveraging professional development and job search resources to their maximum advantage. We integrate faculty, students, alumni and other practitioners to focus on the students' professional development needs and generate ideas and suggestions to help them get the most out of their law school experience. Appointments may be made for career planning and job search advice, resume and cover letter preparation, videotaped mock interviews, tips on salary negotiation, and more. To facilitate entry into practice for our recent graduates, Emory Law offers stipends to its 2018 juris doctor graduates who continue to seek permanent employment. The Fellowship Program for the Class of 2018 begins on September 1, 2018. Emory Law hosts On-Campus Interview (OCI) programs during the late summer and early fall for second- and third-year students. An additional OCI program during the spring semester is open for all students, but it is primarily focused on first-year students. Legal employers and recruiting organizations from across the country participate, including large, medium, and small law firms; corporations; and public interest and government agencies. In addition, Emory Law participates in several regional interview programs held in cities throughout the country. Instead of interviewing on campus, many employers choose to post job listings for part-time positions during the academic year as well as summer and post-graduate employment opportunities. Since many legal employers are unable to hire until a position becomes available, employers recruiting at these programs tend to be larger law firms, government agencies, or corporations who can hire months in advance. Judicial clerkships are highly valued by employers. Most law firms give former clerks credit for one or two years of practice, depending on the length of the clerkship; some firms give former clerks a bonus when they join the firm; and a few firms even require new associates to have clerked. Federal and state court judges employ law graduates to work as their law clerks, typically for a one or two-year appointment. Law clerks may analyze cases, discuss them with the judge, and draft and edit judicial opinions. Clerks for trial judges are involved in building the factual record, and their work can involve motions, orders, status conferences, jury instructions, and trials as well as the more familiar briefs and opinions. Clerks for appellate court judges are presented with the record from the trial court and are asked to resolve legal issues, which typically are presented in the form of briefs, discussed in the form of bench memoranda, and resolved in the form of opinions. For complete information about Emory Law's judicial clerkship opportunities, contact the Center for Public Service or Assistant Dean Rita Sheffey. Every year, we sponsor a large number of career skills and legal career information programs and invite attorneys from the private and public sectors, as well as nationally known speakers, to provide career and job search advice to students. A variety of handouts on topics such as resume preparation, networking and interviewing skills, the judicial clerkship application and interview process, and public interest/government employment. Periodicals (such as the Fulton County Daily Report, Atlanta Business Chronicle, and Wall Street Journal) which list job openings nationwide and provide information about the current legal job market. Books and publications from a variety of sources which discuss career planning, job search techniques, and particular legal practice areas. Emory Law students may order business cards online. We have a prescribed format, so please follow the guidelines below. Please format your business card according to the following guidelines. The Center for Career Strategy and Professional Development, SBA, and AlphaGraphics are not responsible for a student's failure to do so, and no refunds will be issued as a result. 2. Once the page labeled "Students" appears, click "Business Cards." 3. Then, click "Click here to order." 4. Click the red "Create New" button. 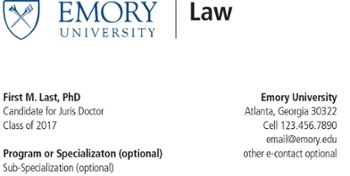 Logo: Select "Emory Law" from the drop down menu. Title Line 1: Enter "Juris Doctor Candidate"
School/ Department 1: Enter "Emory University School of Law"
Department/ Division/ Degree 1: Enter "Class of 20 __ "
Select this option if your local address is temporary and you do not want to provide an alternate permanent address. This choice will automatically insert "Emory University" and "Atlanta, GA 30337" as your address. "Off-Campus" or Select "Off-Campus" to provide your local address or other permanent address. If you plan to change your local address during law school, you may want to use a different address or select "No Address." This choice will automatically insert "Emory University" above your address line. It also provides a space for your on-campus address. Select this option only if you live on-campus at Emory and plan to live on-campus until you graduate. Please do not use the law school's full address on your business cards as it cannot receive or distribute student mail. 6. When all fields are complete, click the red "Save" button at the bottom of the page. You will have an option go back and edit if there is a mistake. 7. Proof the card carefully. Make sure there are no formatting or spelling errors. SBA, the ELS Center for Professional Development, and AlphaGraphics are not responsible for the student's failure to properly proof the card, and no refunds will be issued. Click "Edit" underneath the proof if you need to go back and change the information. 8. Proceed with order specifications, payment, and shipping information. Emory Student Practice Policy The Georgia Supreme Court's student practice rule, effective August 15, 2015, potentially permits both 2L and 3L students to represent clients (under supervision) as if admitted to practice in a broad range of settings, including all government agencies, private firms representing clients pro bono, and nonprofits who assist low or moderate income individuals. Under the terms of the rule, certification is independent of the court or supervisor. It also placed on the law schools the burden of determining which of its students are "prepared" to engage in such practice. Emory certifies all 3Ls and rising 3Ls (provided they have taken Evidence and Trial Techniques), once they complete our ethics and professionalism self-study module. As to 2Ls, we are concerned that students who have just completed the standard first-year curriculum, and have not completed Trial Techniques and Evidence, are not yet prepared to represent clients without restriction, without initially having additional training and closer supervision than the Rule requires. (1) Limited certification -- a law school sponsored pro bono program or externship/practicum placement applies to be approved to train 2Ls to perform specific limited tasks appropriate to the level of experience. The student and program/placement agree that the student may only use the certification in that program/placement, performing the specified tasks. (2) Unrestricted certification -- all clinics, and certain approved externship or practicum placements provide adequate training to substitute for Trial Techniques and Evidence, such that the student will be trained for any student practice setting.This certification is transferable. In either case, the placement must first seek and obtain approval via this form before the student can apply for certification (via this form). The Bar has requested the law schools submit registrations in bulk and will only process them between the first and fifth day of the month, so requests must be submitted by the 30th of April or May for summer; the 30th of July or August for Fall; and by the 30th of November, December and January for Spring. It typically takes about 5-7 business days after the Registrar submits the requests for the Registrar to receive the certificates back from the Bar. You will be notified as soon as they have been received by the Registrar. Let the Career Center team assist you with the employment search process, recruiting, and networking at Emory Law. The Emory Law Ask An Alum LinkedIn group connects students with experienced Emory Law graduates who have volunteered to provide career advice and guidance. Complete your personal profile, search job postings, and apply to interview programs via Symplicity.